July 12 1909 -- The Elks are in town for a convention, and the LA newspapers always blow out all the stops in welcome. 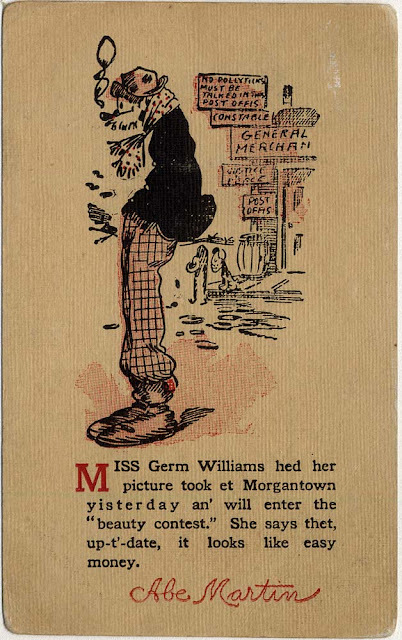 Herriman contributes a page-long cartoon to commemorate their shenanigans. Herriman has several times now used the term "appajava", this time in relation to fiery Mexican food. I assume this is a corruption of a Spanish term, but can't think of what it would be. Ideas? How likely is it that "appajava" might be a humorous corruption of the word "empanada?" Here's the last of the Abe Martin cards I have. Although I'm not particularly a fan of Hubbard's folksy humor, I must admit I got a smile out of this one, especially the mangled (I hope) name of the young miss. Many years ago, I posted an Obscurity of the Day about Chic Jackson's comic strip Roger Bean. The strip was created for the Indianapolis Star in 1913, and received a very light distribution to other newspapers during its 21-year life. In my admittedly spotty reading of the strip I came away with the conclusion that those Hoosiers are willing to put up with some powerfully bad art in trade for some locally produced humor. I also called into question a number of points made in the comic strip reference books. It's a decade later, and that post has accrued a number of pretty interesting comments, some of which rightly take me to task for errors and omissions. Now that the Indianapolis Star is available through newspapers.com, its about time for me to make some corrections, and while I'm at it, pass along some of the heartfelt eulogies that ran in the Star when Jackson suddenly died in 1934 (come back on Monday for that post). 1) I then said that I could find no trace of there ever being a Roger Bean Coffee. 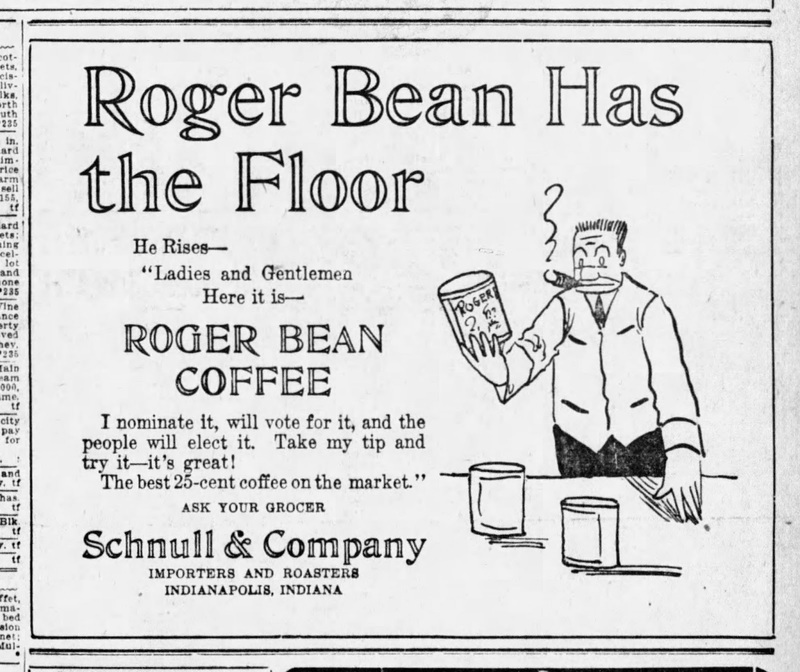 Since then I have indeed found that the coffee brand did exist, and seems to have debuted on store shelves in late 1915. The coffee brand, which was local to Indiana, ceases to be advertised in early 1923. 2) I said that the strip ended on September 23 1933, based on the run in the Chicago Daily News. Turns out that the strip ran in its home paper and a few syndicated outlets right through Jackson's death, and ended with the last strips he'd completed on the day of his death. The final strip actually ran on June 23 1934. 3) I said a decade ago that I saw no evidence that characters aged in Roger Bean, though legend had it that they did. Since then several correspondents have told me that it is indeed true that characters aged in the strip. Now here I go again possibly putting my foot in my mouth, but my impression is that Jackson aged the children in the strip, but the adults pretty much stayed the same age. Nevertheless, I stand corrected that characters did indeed age in Roger Bean. 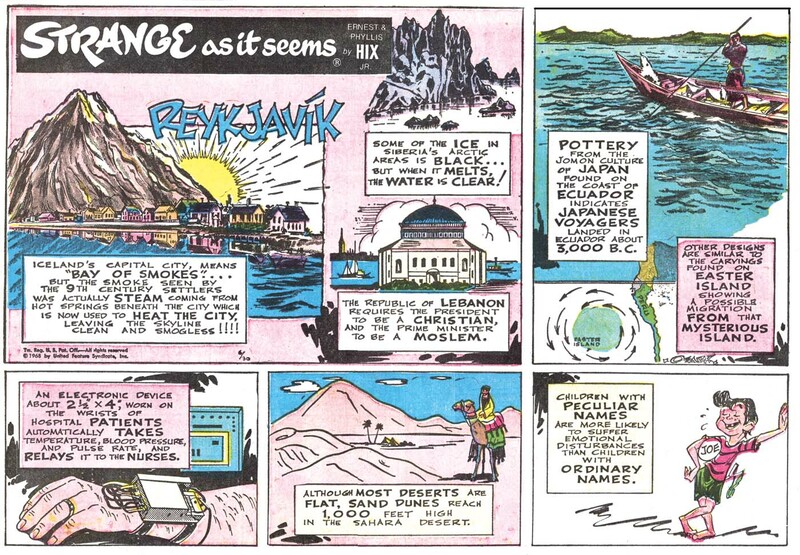 Aging characters was thought to be an innovation created in Gasoline Alley, but evidently Frank King was not the first to come up with that idea. That, however, is not the only parallel between Gasoline Alley and Roger Bean. And here it gets a bit uncomfortable. The Bean's first child, Woody, was an orphan that they found in a basket on their doorstep in the middle of the night. In 1914. The abandoned baby on the doorstep was a long-established cliche; don't know if it was ever that common in real life (one hopes not, but times were even tougher for a single mother). In pop culture usage it was sometimes implied or stated that a male in the household was responsible; otherwise it was an easy device to add a child to a story without the fuss or possible controversy of a pregnancy. To give an idea of its staying power, "Pearls Before Swine" sometimes has the cartoonist trying to wheedle into his wife's good graces by presenting himself as a doorstep baby. Thomas Henry Foley was born on February 3, 1887, in Minneapolis, Minnesota, according to his World War I draft card which also had his full name. The !900 U.S. Federal Census recorded his birth month and year as February 1887. However, a transcription at the Minnesota, Births and Christenings Index (at Ancestry.com) has the same birthplace but the birth year was 1888. In the 1900 census, Foley was the fourth of five children born to John, an Irishman and stone mason, and Ellen, an Englishwoman. The family resided in Minneapolis at 1534 East 22nd Street. Inklings of Foley’s talent appeared frequently in the Minneapolis Journal from 1902 to 1904 in its section, The Journal Junior. Zula J. Bottenfield, Seventh Grade, Madison School, has won the scholarship offered in connection with the work in the Junior advertising department, and is entitled to four months instruction at the Minneapolis School of Fine Arts. As was announced at the beginning, these scholarships are awarded wholly upon the artistic merit of the designs, irrespective as to what makes the best advertisement: All things considered Miss Bottenfield’s work best filled the requirements, although the work of Esther Chapman and Thomas H. Foley is deserving of special mention. Foley was mentioned in St. Nicholas, March 1904. Information about Foley’s training has not been found. American Newspaper Comics (2012) said Foley produced over a dozen comics for the Minneapolis Journal, from 1909 to 1913, including Buddy and His Wonderful Lamp, The City Fairies, and Here’s to Your Health, which debuted late in 1926. In the 1910 census, newspaper artist Foley continued to live with his parents and remaining siblings. They lived in Minneapolis at 2213 Chicago Avenue. On June 5, 1917, Foley signed his World War I draft card. He was married and lived in Excelsior, Minnesota. His description was tall and slender with brown eyes and black hair. Cartoons Magazine, September 1917, published this item about Foley. According to the 1920 census, Foley and Mildred made their home in Minneapolis at 2701 Clinton Avenue. 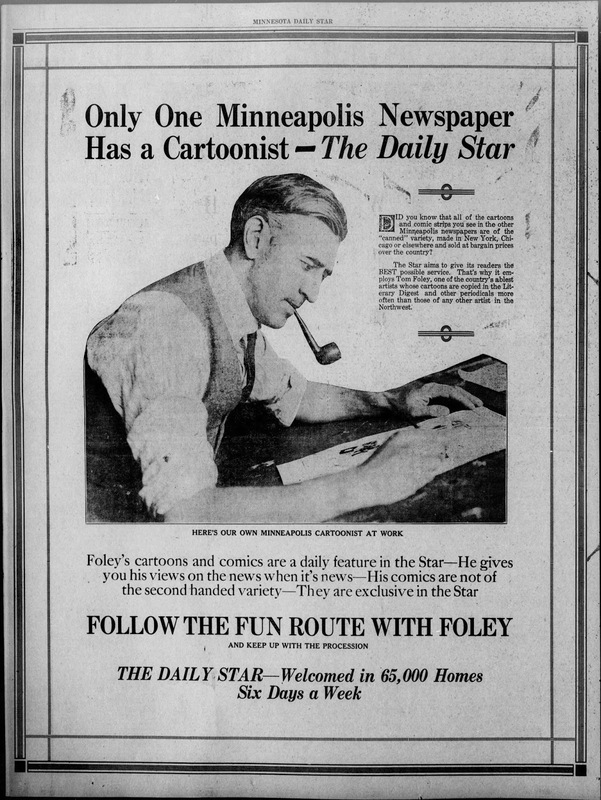 Foley was employed at the Minneapolis Daily Star which featured him in its April 25, 1924 edition. In the 1930 census, the couple were residents of Minnetonka, Minnesota. The census said newspaper artist Foley was 29 when he married Mildred. Foley passed away sometime before the 1940 census which recorded his wife as a widow in St. Louis Park, Minnesota. In an effort to provide health information in an entertaining format for newspaper readers, the United Feature Syndicate came up with the first (at least to my knowledge) comic strip devoted to the subject. The daily strip offered basic information: what to do about a cold, how to treat a bruise, and so on. I was impressed to read very little if any bunkum in these strips. Even the bottom strip, about habitual finger-sucking and pacifier use causing facial abnormalities, to my surprise turned out to be factual. The proposed treatments, on the other hand, seem to be perfectly designed to later send the kid into intensive psychoanalysis. Here's To Your Health was written by J.G. Cowan, of whom I know nothing. I presume he was a medical practitioner of some sort. The art was provided by Tom H. Foley. I know Foley best for his Sunday back-page comics for the Minneapolis Journal, which ran there from 1909-1913. In the 1920s, he pops back up with this series and on the strip When The Great Were Young. He's a fine cartoonist, and its too bad he flew well under the radar. Here's To Your Health had a very short run, from November 8 1926 to January 15 1927. I suspect that it was intended as an evergreen sort of limited series that could be sold and resold. It did not prove to be of much interest to newspaper editors, however, and the only place I've ever encountered what I assume to be the full series is in the Washington Star. Jack Ozark was born Jacob Ozarkawitz on February 21, 1914, in Chicago, Illinois according to his Social Security application which was transcribed at Ancestry.com. World War II draft card. However, Ozark’s World War II draft card said he was born October 21, 1915. In the census records, Ozark’s parents were Samuel and Ethel, both Russian emigrants. Ozark’s Social Security application said his father’s first name was Simon. A 1917 New Brunswick, New Jersey, city directory listed Samuel as a huckster who resided at 5 Bishop Street. In 1920 U.S. Federal Census, Ozark and his parents were Racine, Wisconsin residents at 1610 Frederick Street. Izark’s father worked at a bakery. Paterson, New Jersey city directories for 1923 and 1924 listed Ozark’s father at 310 Hamilton Avenue and the following year at 473 East 26th Street. Ozark was a student in the 1930 census. The Ozark family lived at 395 East 28th Street in Paterson. Ozark’s father was a weaver at a silk mill. The Popeye Cartoons website said Ozark “had a passion for sports cartooning that started while in grade school drawing for ‘The Criterion’ — Patterson (New Jersey) Eastside High School’s monthly magazine. Jack used samples of those sports cartoon to secure a job at the Fleischer Studio in 1932.” According to Cartoon Research, “Jack Ozark began in animation at Fleischer on March 4, 1932, at age 17, probably as an opaquer, working his way up to becoming an animator. In Miami, he worked on Gulliver’s Travels, animating on the ‘It’s a Hap-Hap-Happy Day’ sequence….” The Animation Guild said Ozark also worked on Mr. Bug Goes to Town and the early Superman shorts. Ozark was listed in the 1933 and 1936 Paterson directories with the latter saying he was an employee with Fleischer Studios Inc. The 1937 directory said Ozark had moved to New York City. The 1936 and 1937 directories misspelled his surname “Ozarkowitz”. The 1940 census recorded Ozark in Miami, Florida where the Fleischer Studios had relocated. The cartoonist’s home address was 1520 S.W. 5th Street. The census said he had completed four years of high school. On October 14, 1940, Ozark registered with the army. His description was six feet, 190 pounds with blue eyes and brown hair. Ozark was a Connecticut resident when he enlisted in New York City on April 20, 1942. Ozark’s military record said he had three years of high school education. The Fleishcer Studios website described Ozark’s time in the army. …Upon arrival at the Signal Corps, Ozark was given an intelligence test that stopped short his stay. The results revealed that he had close to a genius I.Q. Taking advantage of Jack’s brainpower, the army decided to station him in northern Canada as a code breaker…. The Florida, County Marriage Records at Ancestry.com said Ozark married Shana Levinsohn on October 16, 1943. In the 1970s Ozark contributed art to horse racing publication, American Turf Monthly. Ozark passed away November 16, 2000, in California. He was laid to rest at Mount Sinai Memorial Park. I worked with Jack at Filmation in the summer of 1968. Jack was a funny, friendly person who loved to tell stories. His favorite studio was Fleischer's, and he liked to sing some of the songs from Gulliver's Travels to us "kids". His trademark phrase was "I'm master of the mirror, kid!" Jack kept a small mirror on the side of his animation desk and used it to get the expressions right for his characters. Jack could really turn out animation fast, which explains why he spent 20 years at Filmation!